Okay, here's the deal. I took His Royal Highness Chief No-Nag Metalheart to the heart hospital last week, and we both got the flu there. We are recovering, but you know how that goes - we have all the energy of some prehistoric sloth species at the moment. I'm bitter, because we were looking for the flu shots but they hadn't come in yet. And he has to go back next week. Ulp! So I have not had the energy to blog the very interesting back-and-forth between the Fed Heads, but the summary I've come up with is that those who truly want to taper this year are now arguing for a formalistic move at the next meeting (in other words, conceding that they've lost the argument), and many are completely opposed. Therefore there will be no real taper this year. The reason why is pretty clear. By any real standard, the conditions that the Fed was trying to address with QE3 have only gotten worse, and although they are still predicting some sort of pickup in the second half, those arguing for a taper will have to wait until that appears before their arguments gain any traction. 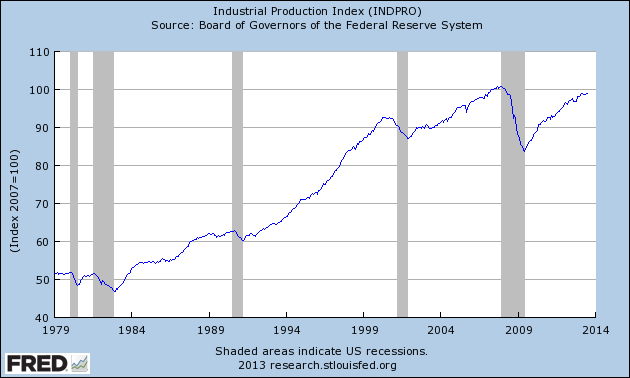 It's hard indeed to look at this graph and argue that the economy is picking up speed. The green line, indexed to the right, is the best of the indicators - the YoY change in four-week moving average for initial claims. That is truly benign. However those aren't necessarily a good indicator until after a recession has begun, and that's what the Fed is trying to avert. The quite-correlated blue and red series are YoY change in real final sales of domestic product and YoY change in full-time employment. Neither look optimistic at the moment, and since the change in full-time employment follows that blue line, the Fed wants to see the blue line at least stabilize for a few quarters before it tightens anything. 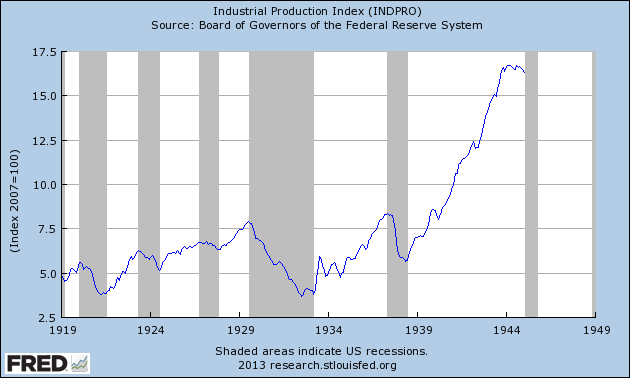 The blue line is currently below the post-WWII recession line and it has been. Even if you argue for a new normal, they want to see that thing straighten out and stick for a bit before doing anything. And then, it's obvious that housing is interest-rate sensitive, and there is little hope of that blue line straightening out if the housing recovery doesn't at least stay up to about current levels. Nothing about employment suggests that it is feeding a significant spending expansion into the economy at the moment that could overcome a rebound in mortgage rates. I do watch these two indicators quite carefully for an upper-bound assessment of corporate spending inputs for the next year of economic projections. The top line (net cash flow with inventory valuation adjustment) measures the real flow of money rolling through corporate hands that could be reinvested. 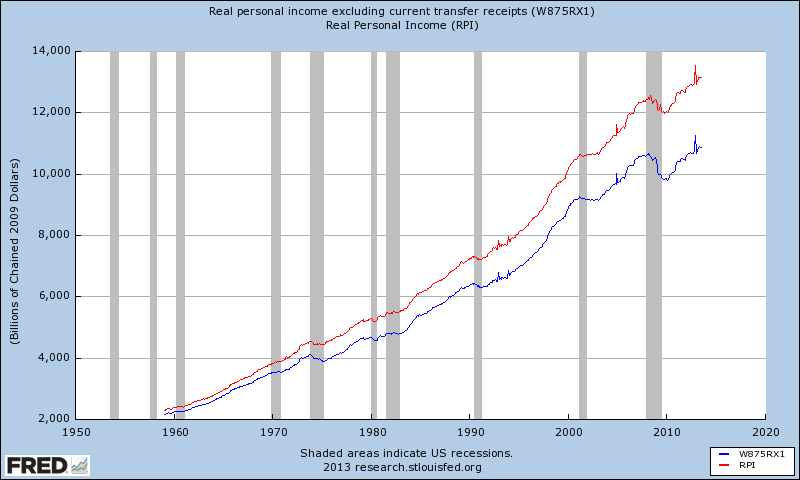 The bottom blue line is undistributed profits with both IVA and capital consumption adjustment. 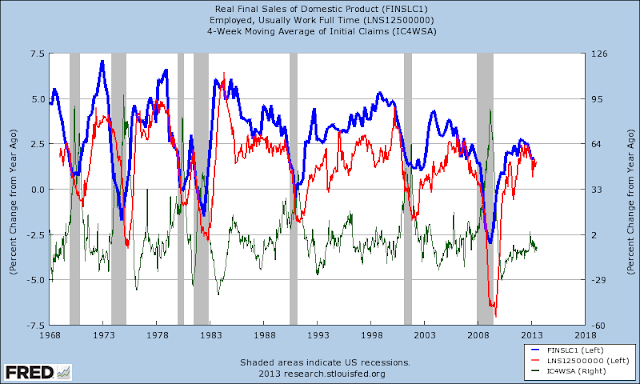 Historically, sustained weakness in these measures tends to be highly predictive of domestic downturns, and even if everything else looks bad, if these two measures are still growing or cash flow is growing while undistributed profits are not, it generally flags a growth recession not a recession. If you look at the mid 90s growth recession period, you see these two growing and no recession emerged. But right now these two really don't look good. You can often see recessions being born more than a year in advance using these two measures. Companies that are not making more money tend to start watching their bottom lines very carefully, and slow cuts in expenses have a ripple effect across the economy. The last two quarters have turned in some rough numbers, with the blue line now being about where it was in Q3 2009. You are not going to see a Fed tightening under these circs. Tax policy has not helped. Raising capital gains rates is kind of suicidal in these conditions - you need to pump corporate investment, not restrain it. Now, I do differ from most in believing that the natural trajectory this year was for consumer-side weakness to slowly increase through the year rather than decrease. I may be wrong of course, but nothing I know about how these things work tells me that we could hit the tax increase/sequester peak before late in the third quarter. Which is where we now are, and frankly when I browse around things look pretty slim. Not disastrous, but kind of grinding on the pavement. The real question, therefore, is why we are not yet in a recession? I think it is not because of the Fed action, but because of the M_O_M fudge factor gained by much higher levels of personal current transfers (i.e. 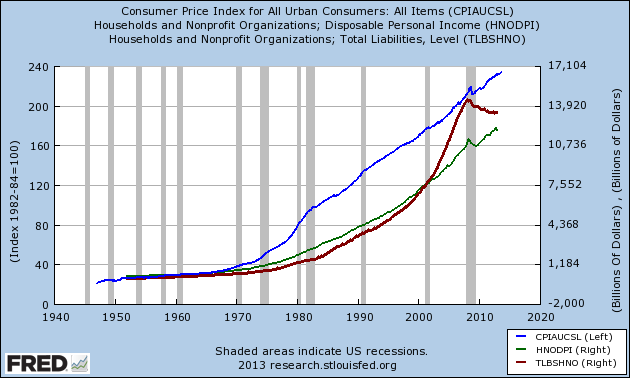 SS, Medicare, SSI, DI, SNAP, etc) feeding into a stability in consumer spending. One could also call this the Europeanization factor, because this is what the European economies have done. They can stay up at very low levels of growth for quite a while because there is much less sensitivity in consumer spending relating to employment. Small weaknesses in employment are smoothed out by the high proportion of consumer spending funded by the government. The downside of depending on the government welfare income stream to sustain PCE is that consumer spending becomes acutely sensitive to inflation. There are significant arguments on the taper side, but the reality is that if the Fed ever agreed to QE3, which it did, it is clear that the QE arguments loom larger in their minds than the negative arguments, and it is not realistic to expect them to suddenly abandon this course. I read this as no taper this year at all. Unless the administration succeeds in starting a war (the actual opponent is irrelevant; the administration just needs a war), the FOMC will wait to see how federal fiscal policy develops before deciding whether to increase asset purchases. I believe the Fed may be discussing ways and means of buying assets but lending them back to the banks to serve as a hard collateral base. There's no technical reason why they could not do this, and they may have to do it if they continue their asset purchase program much longer, or increase it. Depending on what Congress does, the Fed may increase its asset purchases next year. Real median household income was 51,017 in 2012 vs. 51,100 in 2011. Not statistically significant. 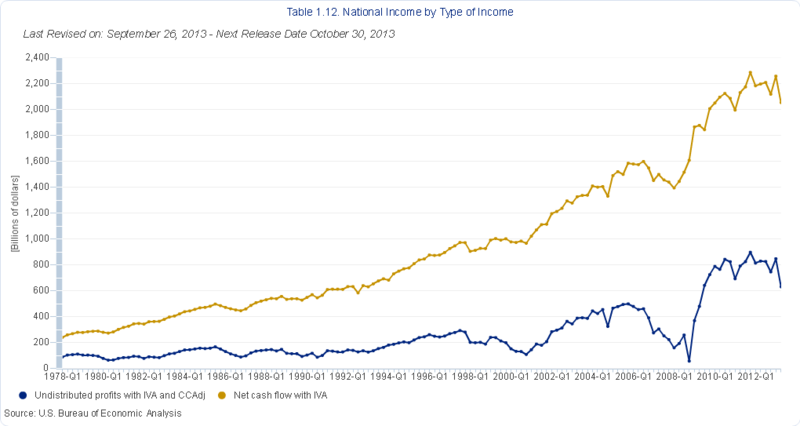 Since the income peak real median household income is down 8.3%. Since the peak before the previous recession (1999), real median household income has declined 9%. But actually some signs of recovery do exist. The bottom two quintiles either lost or held steady, and the top quintile and the top 5% lost. The middle two gained. These changes are not really statistically significant, but probably they really are, considering the looming tax increase pulled-forward income shift from 2013 to 2012, which showed up the most for the wealthiest households. When interpreting these measures, it's important to remember that as new households form the median income should tend to shift downwards a bit. Also when looking at real median incomes by race, don't forget to factor in larger numbers of younger people among groups such as Hispanics and Blacks. But regardless, income measures such as these do tend to accurately reflect the need for government welfare programs, although income from government welfare programs is not counted. Now add to this the impact of this year's tax increases, and it's not hard to understand why we have low consumer inflation. We simply don't have the circulating money income to cover much in the way of cost increases. As a wild guess, more households still want to delever than otherwise. This chart shows nominal instead of "real" debt, but the dizzying rise in nominal debt since the 1990 real median household income point implies that we are still overloaded with debt. Those student loans aren't going to encourage the younger cohort to live large on a borrowed dime either. 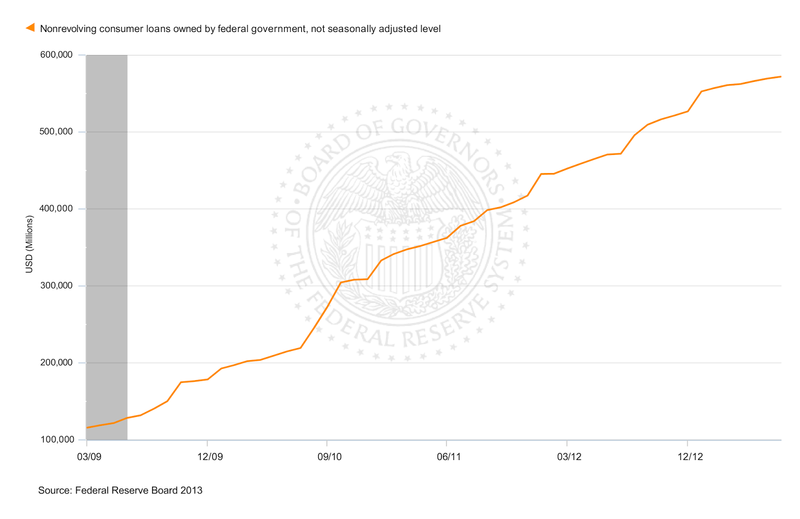 The interesting thing is that there are two implications for the Fed. The first is that future guidance as to rates means little in terms of a houshold's propensity to borrow, except perhaps for home loans and auto loans (both of which are currently shifting to the less affordable). The second is that if they ever want to try to inflate out of this, they really need to do it pronto. Aging households imply that five and ten years down the line it will be impossible. Here, free, really. Caltech put 'em up. And if you think you are not interested, I suggest you start with Chapter 3 - the relationship of physics to other sciences. Economics is not included as a science, and at this point I think that exclusion still stands. Higher taxes and employee benefits boost U.S. manufacturing costs to 9 percent more than the average of the country’s nine-largest trading partners, according to a Sept. 3 report by a team of JPMorgan Chase & Co. analysts. It's not hard to see why European employment is so bad. I expect that the latest dip was partly due to Germany's floods, but obviously the trend is entirely unencouraging. However given our problems, our own employment levels still have only recovered to 2006 levels. The best way to describe the current trend in the US is that it has shifted sharply toward that of Europe, and what you see in European IP trends is the likely result in the US. It is true that manufacturing is becoming globalized, but much of the globalization is focused toward manufacturing more in the country where the goods will be sold. As the net surplus incomes and savings of the populations in the developed countries decline, production will also. I don't know what to make of this at all, but I am unwilling to dig a hole and pretend it doesn't mean anything. I have been reading this data for a very long time and I find it highly useful. This is most unfortunate. Admittedly credit by historical standards is very easy to get and very cheap, but heading to the bank with your hand out with collapsing earnings is not a pleasant experience. Remember when I posted that this all had a 2008 feel to it? This has made me twitchy, I can tell you. Note the high expectations for the future. By far the best of the recovery. It may be that retirements are beginning to generate more hiring impetus. Inventories and sales don't support the hiring plans. There is a high retail/hospitality component to this report, and it may be that ACA changes are moving this indicator also. Last month's report was one of the big samples, so the sudden change between last month's figures and this month's figures could partly be explained by that. But I have the wind up. Read the report for inventories - that indicator is not flamingly positive at this time. “ This bodes pretty well for the coming months , as long as nothing affects sales numbers drastically,” said Kuehl. Uh, yeah. I just went back and read NACM again to see if I had missed anything, and I hadn't. Consolidation was the name of the game, and that's positive. I am stuck again on the horns of the dilemma with which I began the year. The actual on-the-ground change from the tax bill picks up strength through the year, and is accentuated by business and investment taxation changes which will tend to hit investment. The weakness in new home purchases I believed would show up at the end of the summer, and it apparently has. So now we move into what is supposed to be the Fed taper sequence, yet I think it is very likely that they will find themselves either not tapering or beginning to taper and reaccelerating purchases. But what can they buy? I did not expect to see this in NFIB. The next two months will be interesting indeed. Japan's ability to use monetary policy to reverse its long deflation is limited, because it is very hard to execute when you have to import the basics, esp. energy. The decisive turn for Japan really occurred on 3/11 with the earthquake/tsunami disaster followed by the Fukushima Daiichi meltdown. The consequence - unavoidable - was that an economy dependent on nuclear energy was converted to an economy dependent on imported energy. If 3/11 had not happened, it is possible that cheapening the yen could increase exports and perhaps buy Japan some time and space. But 3/11 did happen, and at least half of the nuclear plants will never reopen. Earlier in this sequence I kept reading articles about how Japan's exports were rising and how this showed the brilliance of Abenomics. But it doesn't, because when you devalue your currency to boost exports, the trade-off is that necessary imports must drop in order to actually achieve something. The coverage is beginning to become more realistic now. If the situation were not so tragic, I would cattily remark that half of that must be to TEPCO. Thus, the government feels impelled to raise revenues in a real sense, which implies domestic deflation. Don't forget that Japan is still struggling with the aftermath of the devastating 3/11 disaster. Less than a month ago the last of the areas without power were reconnected. Japan had a structural governmental deficit before then, but since it has accelerated. If it were not for the demographic situation, perhaps Japan could inflate its currency sufficiently to deflate away a lot of its government debt in real terms. But it is not clear how this can happen when pension funds will have to shift investments to compensate! BoJ will have to keep buying, but this has never ended well for any country. The logic is that it will inflate stocks, and perhaps it will. But as nominal money value diminishes, the relative influence of shifting private savings from bonds to stocks will naturally dwindle, indicating that there is an upper limit. Business investment is rising, but not hugely, and there is a natural limit there as well. The natural strategy for Japanese investors is now to outsource capital - to buy overseas bonds and equities - so as to profit from the currency changes. This is not a recipe for long-term optimism. Japanese disposable personal income will naturally drop as a result of the tax increase, and retail sales and consumer confidence will as well. The report is here. The notable factors are not the headline numbers (7.3% unemployment rate, Establishment Survey jobs +169K) but the underlying detail. There were substantial downward revisions for the past two months in Establishment Survey jobs, with July's total nonfarm down to 104K. The unemployment rate is down, but that's due entirely to a drop in participation rate, which had been at 58.7 for the last two months, but fell to 58.6 this month. It is entirely possible for SA employment numbers to move in two opposite directions in the two surveys (Household vs. Establishment), and this is one of the months in which they do. The Household number of total employed fell 115K whereas the Establishment count rose 169K. The unemployment rate keeps falling, and it's not hard to see why with the not-in-labor-force number rising 516K this month. The civilian noninstitutional population rose 203K, so a net loss of over 300K from those who could be working or looking for work really moves the numbers. The downward revision for Establishment in July probably was significantly related to the car shutdown, so I don't view either the Establishment survey or the Household survey as indicating a change in direction. However both seem to show a pretty weak economy job-wise. The YoY jobs gain for the Household survey is almost exactly 2 million. The YoY for Establishment total nonfarm (you have to get this from the historical table) is slightly better at close to 2.2 million (I'm doing this from memory because the table is currently unavailable). The two-month total for Household is 112K, which is not good, but which should increase next month as all of the education jobs are picked up. One very large factor driving the unemployment rate down are retirements. The increase in the labor force (those working or actively looking for work) over the year was 864K, although the overall increase in civilian non-institutional population was more like 2.4 million.. Jobs are growing at a slower rate than would be historically expected, but that rate is significantly lower than the rate of exits from the labor force, therefore the improvement in official unemployment rates has legs as a trend. The 25-and-older unemployment rate for those with at least a college degree has dropped to 3.5%, indicating a much-improved environment. Discouraged workers grew slightly over the year, but marginally attached to the labor force did not, so it really is retirements. This is still a very difficult environment for young people looking for their first "real" job. The younger average age among black workers probably accounts for the excruciatingly high unemployment rate of 13%, but it still burns. Hispanic unemployment rates are 9.3%, Asian unemployment rate is at 5.1%, and white unemployment rate is at 6.4%. And ages do account for some of this, but not all. It is an even worse environment for older workers who lose a job (the 60-and-older crew). They probably account for the monthly increase in the 27-week and over unemployment. This has dropped over the year, and it's probably because many of these older workers have reached retirement age. The end of the auto plant July shutdown probably accounts for the big monthly drop in part-time workers due to slack work. Over the year the part-time for economic reasons number has only dropped about 130K, but part of that is due to the retail/restaurant jobs ACA effect. Turning again to the Establishment survey, service jobs were weak at 134K, saved by the big increase in health/education jobs (38K, versus July's 15K). Private jobs, when adjusted for the auto shutdown don't seem to have changed from July to August, although the headline numbers did (127K/152K). Government jobs dropped 23K in July and increased 17K in August, which is not surprising given education calenders and doesn't reveal much of a trend. To get a sense of just how weak the underlying job creation trend is, perhaps table A-13 is the best quick overview. This table gives a YoY non-seasonally adjusted comparison for various fields, so all error is survey error. Note the YoY drop in production occupations! This table gives the YoY employment gain at about 1.95 million. Construction helped. Since we have growing employment stability, as evidenced by the very favorable trend in unemployment apps, there is a somewhat more favorable impact on spending than one would expect from raw job gains. 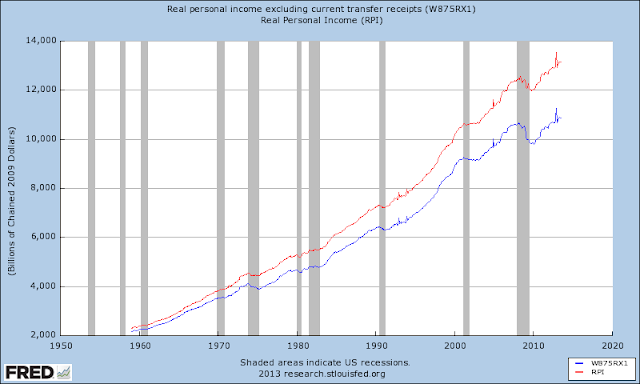 After all, consumuer spending trends depend not just on jobs but on the certainty of income from those jobs. Retirement incomes are mostly stable also, so there is a growing strength to the spending "floor" compared to the economy of even ten years ago. However, the correlated axiom to the above M_O_M fudge factor effect is that this economy is extremely sensitive to inflation trends. Exceptionally so when compared against the economy of a decade ago, or even the entire range of post WWII experience. And this trend too has legs. This sensitivity will probably slowly increase over the next twenty years. Thus, theories that increasing inflation will materially help the US economy are slightly off the mark. This economy cannot probably achieve a 2% inflation rate. It's literally not in the cards. 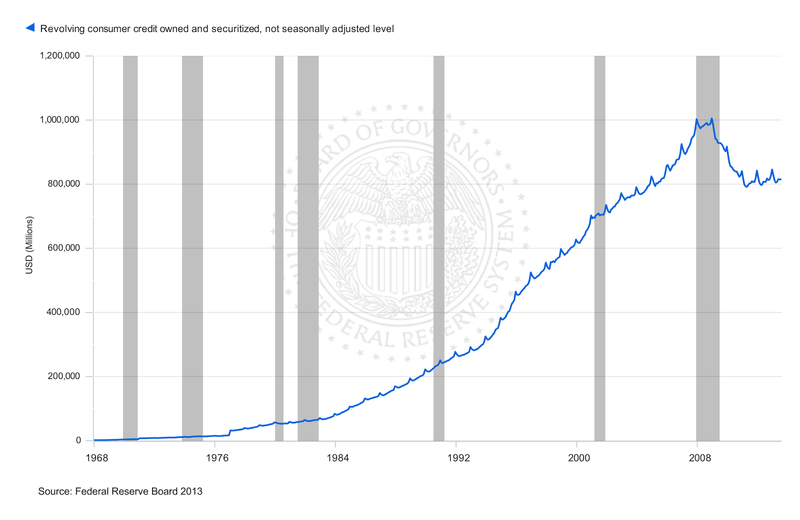 The retraction of consumer spending is too front-loaded. Also the official CPI is very ineffective at gauging real household spending tendencies - much of household expenditures fall in the range of "forced" spending for fuel & energy, food, medicine and taxes. Any increases in these blocks will force an immediate hard retraction in spending in other, more discretionary blocs. For China and such countries, the implications are rather dramatic. Europe is in the same boat. These two huge consumer blocs have driven much of the Asian expansion over the last twenty years, and now that's wearing to a natural end. Update: The most problematic feature of the employment reports was of course seized upon by Mark. Go to the link for the lovely graphs and music. So maybe it's not just mechanization, huh? Hmm, hmm, this looks familiar somehow. Where/when have I seen this before???????? History is not the Fed's housecat. On the brighter side, time cures all ills, and it will eventually cure ours. My favorite O Fortuna version.